A similar statement, only a bit longer and probably typed, came from DG DIGIT of the Commission claiming to phase out all personal computers by the end of 2011 and returning to typewriters. (you could "See here a copy of the statement we received" if we could figure out how to upload a pdf on blogger.com. anyone?) We of course had some fun putting together a press release on the extension of the Hungarian Presidency. In exchange for the extension, we made it clear that ”Poland and Denmark could take our slot in 2025 and 2038. Negotiations with Cyprus are still ongoing to make sure that they don’t collide with the Turkish presidency in 2054.” (read the whole text here) But this all was amateurish ”bricolage” compared to the Mumsnet/BBC hoax titled ”Dads launch class action against Mumsnet”. The BBC even had to officially clarify that this was not a BBC article, and we are convinced that many have fallen for the trick. 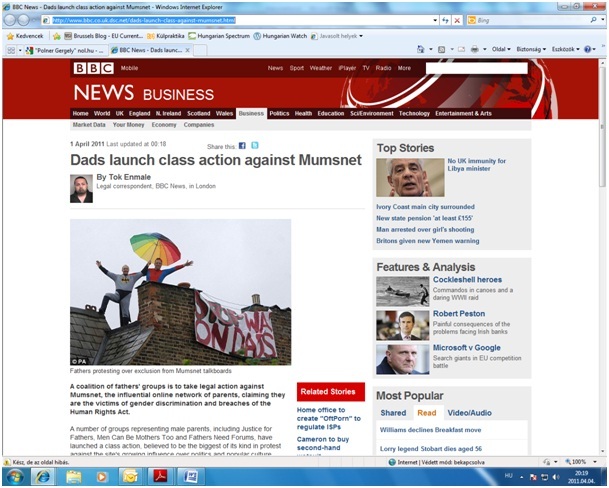 Why do we think that the Mumsnet hoax should carry the April’s Fools’ prize? We love the style. "Just as Oscar Wilde once suffered for his sexuality, and Hamlet is not Hamlet without the Prince, these men are paying the price of a cruel twist of genetic fate." 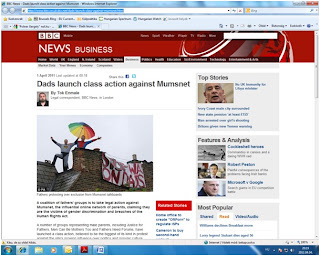 We love the professional execution – we commend Mumsnet (or whoever did it) for going the extra mile and setting up a fake BBC Website, with a domain name not immediately obviously fake to the uninitiated and with links pointing to the real BBC website. It has not only beaten the Brussels bubble which is ultimately coolness challenged, but also main stream media, like the Intependent’s funny story of ‘Portugal selling Ronaldo to Spain’ to pay a part of the national debt. We missed a rather funny take by the ever-active Bruxelles2 on the resignation of HR Ashton (read here). Some of our sources said that some actually believed the news thus creating quite an excitement!